Role playing games have been criticized for many things that are easily explained. Readers of this magazine don’t need to hear why the involvement of magic, false gods, or demons and devils isn’t a real objection to role playing per se. Or hear why it doesn’t matter if we play with non-Christians whose characters may reject God and His morality even more than they themselves have. But once all of these questions have been answered, one comes back that is not so easy to dismiss. Characters in role playing games have an alarming tendency to solve problems by the use of force, even what we would have to admit is at times violent, bloody, gory, unnecessary force. Yet Christians are called to turn the other cheek, to suffer when persecuted for the faith; in most games, that will get your character killed “right quick”—and this seems in some ways to mirror reality. Where would the world be today had not Christians in many countries joined with their countrymen to oppose Germany and Japan during World War II? And do we truly believe that Christians should not serve as police officers, soldiers, or in other potentially violent occupations? Although a few among us might say so, for most of us the idea that we should expect God to stop evildoers when we are not willing to do so ourselves is hardly more defensible than permitting them to continue harming others unopposed. But even those who would easily admit that violence is a necessary evil to be used to oppose evil will still question whether imagined violence is acceptable. This argument recurs in uncounted contexts: are our television shows too violent for our children? Are our movies too violent for the rest of us? Is cartoon violence inappropriate? What about the violence in video games? In which sports is the violence excessive—Boxing? Wrestling? Martial arts? Football? Hockey? Should we read about violence in literature? We live in a society surrounded by violence, and many of us deplore some of its violent aspects. It should not surprise us that such violence reflected in our games would raise the ire of, or at least the questions of, critics. Do the arguments that would favor the use of real violence in the real world break down when it comes to our recreational activities? Are there good arguments that can take their place? Perhaps we should first come to grips with the arguments that support real violence. Some of those arguments may help us in understanding the place of the imaginary variety. Our legal systems almost universally recognize the right of self-defense. Under the “common law” handed down by the British legal system to most English speaking countries, it is generally held that anyone attacked with force may respond with a comparable level of force which could reasonably be expected to repel the attacker. A person who reasonably believes he is in danger of serious injury may use force sufficient to cause serious injury; one who reasonably believes his life endangered may use lethal force. However, we as Christians question this. We have been charged with returning love for hate, kindness for violence, forgiveness for abuse. We may not agree on how this works in the real world, but we do recognize an obligation to do things differently from the rest of the world in this regard. In general, we would recognize the right of an individual to protect himself, but in particular we question whether we should exercise that right ourselves. But our legal system also recognizes the defense of third persons. That is, if you reasonably believe that someone else has been threatened with violence, you have the right to use a comparable level of force to defend that person, just as you would be permitted to do in defending yourself. It is at this point that most (but not nearly all) Christians will agree. I might not stand to protect myself, but I should not hesitate to protect my family, my friends, my country, even strangers from violence or evil inflicted by others, and to use force to do so if it is necessary. Even those who would not do so, who would say that we should stand by and return love for hate when those close to us are the victims, would recognize that this is a strong argument for a time for violence in the real world. There is another nuance in the law related to violence that may be the basis for much of our violent recreational activities: the concept of mutual consent. When two prizefighters step into the ring and pummel each other senseless, we overlook conduct which if performed in the public streets would be interrupted by the police; but the fighters have made it quite clear that each has given the other permission to hit him within certain rules and have assumed the risk that he might be injured in an unexpected way. However, as recent events in the ring have reminded us, he has not consented to all forms of violence, only to those which are within the rules, or which are caused accidentally by an unintended breach of them. Under the common law, no one may consent to his own death, nor to any form of violence which is more likely to result in his death than not. But anyone can consent to participate in a situation in which he might be severely injured, and without that many of our athletic activities would have become quite illegal. Most Christians accept this mutual consent concept for that purpose. We smash into each other playing football at the church picnic, learn and practice martial arts to keep in shape, teach kids to box or wrestle to keep them off the streets and out of trouble. If I get hurt here, that’s OK—I agreed to do this knowing that I might. So we recognize that violence may be appropriate (dare I say correct?) in defending others, maybe in our recreation if we agree, and possibly in defending ourselves. But does any of this translate to imaginary violence? Some of it does, and perhaps there are other justifications for imaginary violence. We have made records of the battles we or our ancestors fought. Reading these records can be very instructive, and on several levels. Military officers are required to study the history of battles because, despite major advances in our technology and weaponry, the battles fought in the past teach us much about combat in the field we call “tactics”. By studying tactics, we become better able to defend ourselves. It is much like studying the recorded chess games of grand masters: if we’ve already seen the trap, we are less likely to step into it somewhere else. Knowing how to fight improves your chances to win; that goes beyond mere training in boxing or weapon use to understanding troop movements and strategy. We also learn much about why wars were fought and how men thought, and we discover that those in the past often expected their battles to be easy, and they were just as often surprised to discover how difficult and painful war was. Those of us who have never been to war still have an understanding of what war is like from our knowledge of battles in the past, and whether we studied these in books or found them in more accessible media such as movies and television, we learned many of the same lessons. 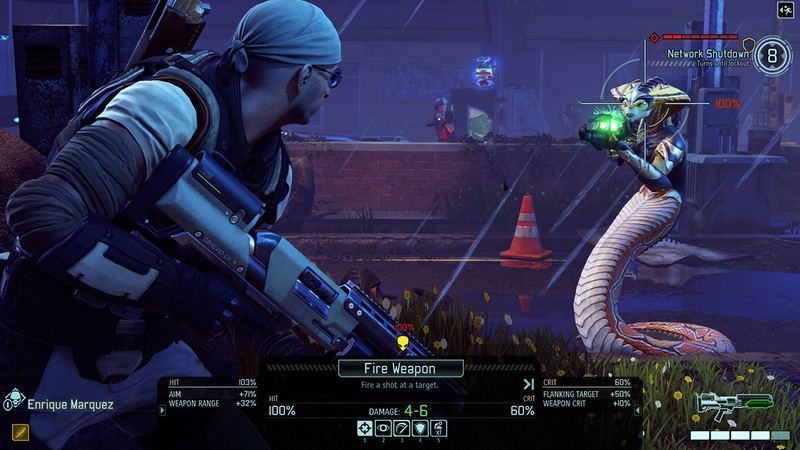 Screenshot from Firaxis Games’ X-Com 2. But we can learn those lessons from imaginary wars as well. Whether we are using simulation games (from Wells’ miniatures rules to computerized tactical games) to change a past battle to see if the outcome is better, or to create a battle we hope not to fight in the future, or to create a battle on an imaginary terrain, we learn more about what is by asking what could have been. A completely fictitious war in a book or movie can tell us much about the nature of war, some of which we might not learn from an account of an actual event. I saw Starship Troopers in the theatre—a very rare event for me to see a film in the cinema, but a friend invited me. As I watched the gore and carnage on the screen, I suddenly thought, “This was a World War II script that got changed to scifi because no one would buy a World War II movie.” On my way out, my friend informed me that the story was from the work of a respected science fiction author, so I shelved my notion. Later I heard an interview with the director, a man who grew up in northern Europe during that war, and who wanted to bring the reality of that horror to the screen. I don’t watch a lot of war movies, but there was something about the battles depicted here which seemed very real despite the fantastic nature of the story. I understood something about war in a way I had not done before; I suspect many who saw that movie came away thinking that it was not much fun to be in the middle of one. And I learn about war and about combat playing RPGs. OK, I probably enjoy being able to win the fights; I was the kid that everyone always wanted to beat up after school, just to prove they were man enough to beat up some scrawny kid who didn’t want to fight. They would jump me, I would scratch and kick and bite, and they would beat me up and complain that I didn’t fight fair. So perhaps there is a bit of satisfaction in being able to win—and I am not sure that this boost to my self-esteem is a bad thing. Those of us accustomed to losing tend to become fatalistic, and so to believe that God Himself is against us; to be able to win at something may be essential to the human psyche. But over the years of playing and refereeing I’ve learned quite a bit about how to fight, and how to avoid fighting, and when to fight or avoid fighting. I think many of the players at my table have learned some of those same lessons. When I lead a party, I don’t lose anyone—I consider the lives of my party members most precious. Other players have seen that it’s sometimes necessary to fight, and always necessary to survive a fight, but there are other ways to deal with many situations. But there’s another reason for violence in fantasy—an allegorical reason. One of the things which I found very valuable about Dungeons & Dragons was the way in which it brought player characters into the midst of the eternal struggle between good and evil. While other ministries were shouting that this horrible game mentioned demons and devils so many times in its encyclopedia (fewer, incidentally, than the Britannica), I was praising it for the same reason: it put mere mortals up against powers, principalities, and dominions in a battle over ultimate moral principles. I wondered if some Christians were just jealous that they hadn’t thought of it first! The real warfare going on in our world was being portrayed in a game which people who had never considered such a thing as real were eagerly playing. Of course, the weapons of our warfare are spiritual. But they are described by analogy to mortal weapons: the sword of the Spirit, the shield of faith, the breastplate of righteousness, even the stance we take—feet firmly planted—reflects the physical combat model. And if you argue that the game suggests that we mere mortals might on our own defeat demons and devils with mere physical weapons, you are mistaken: only weapons with a supernatural element, “magic” weapons, or pure supernatural power itself, “magic” can be used against these spirit beings. How much closer to the spiritual reality could you get and still have a game? It’s not perfect, but few things are, and this is a far sight closer than many others. In Perelandra , C. S. Lewis presents an unfallen world into which come a tempter and a protector, both in mortal personae. The tempter, a man possessed by Satan, begins a calculated series of thoughts and arguments in an effort to cause the woman to question the command which she must not disobey. The protector is a man who has spoken to angels but is perhaps a step behind in understanding the problem confronting him. Eventually the thought occurs to him that the temptation has been going on for an incredibly long time—weeks, perhaps months—and that it is unlikely to end as long as the mortal form of the devil is present. But should he use violence to end the matter, killing the shell that was once a man? Is it up to him to make that decision? The decision is taken from him—the tempter recognizes that his presence is helping to keep the woman from falling, and attacks him. In the battle that ensues, the protector realizes that he has found the purpose for anger, hatred, and violence: it is there to give us the strength we need to oppose evil and to protect others. His battle was physical and spiritual. We, too, may have battles which are either or both, and in some of these battles may have to rely upon the strength which comes from these emotions. I have never needed these emotions in my gaming; but I have learned about them and seen how they could be important in the battle against evil. The tactics we use, like the weapons, are not often the same. But the lessons we learn and teach are still valuable.